The Wall is using Smore newsletters to spread the word online. India Art Fair failed to impress this year too, bringing back some new works in the same old packaging.There is lack of innovation in terms of art works and layout alike. As far as foreign participants are concerned we didn't see many galleries returning from last year's edition. 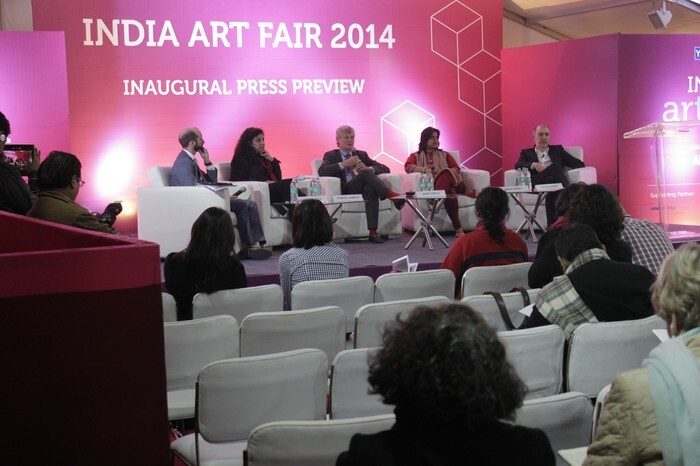 Do read our cover story and get a critical take, different from the rest of the media, on the 6th edition of India Art Fair. “I often wear multiple hats at any given point,” says the Director of Khoj, India’s premiere not-for-profit arts initiative. Stephanie Samuel hears her story - of Khoj, of parallel ventures, the state of arts infrastructure in India and the need of the hour. Subodh Gupta's iconic masterpiece from the stellar retrospective at NGMA-Delhi. We bring you two great shows from two metros - 'No Parsi is an Island' at NGMA - Mumbai reviewed by author and poet, Jerry Pinto and 'When High Art and Low Art Meet' at Art Alive - Gurgaon, reviewed by The Wall editorial team.